As it turns out, the Titanic had a sister ship; in fact, she had two, the Olympic and the Britannic (which began life with a hubristic name more in line with her sisters: the Gigantic. Gigantic!). The Olympic was the oldest of the three, and the only one that managed to live its useful life without sinking, though it seems she managed to wreck a few other ships along the way. And she’s also the only one that sailed long enough to have a cocktail named for her. The Olympic Cocktail was first published on the heels of Prohibition, in Harry Craddock’s 1933 Savoy Cocktail Book —nearly at the end of the Olympic’s career. In the Prohibition era, the great ocean liners still provided the only passenger service across the Atlantic, and throughout those years, the Olympic was the ship of movie stars and celebrities. It remained one of the biggest, fastest, and especially, the most luxurious and fashionable way to travel between Europe and America. It’s no wonder that it should have its own cocktail. Shake with ice until cold, strain into a chilled cocktail stem. Normally, I don’t pursue cocktails that include orange juice. Over time, I’ve come to find that orange is a difficult ingredient, much more so than I ever would have guessed, but in the Olympic, orange works well. The important thing is to use enough of it. The modern, lemon-soured Sidecar, in comparison, is usually brandy-heavy, with smaller portions of lemon and Cointreau. The orange-soured Olympic works well with all ingredients in the neighborhood of equal proportions. 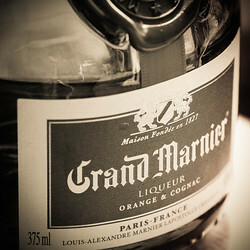 The Grand Marnier is an excellent curaçao in the Olympic. Its brandy base seems to help blend the ingredient flavors smoothly. 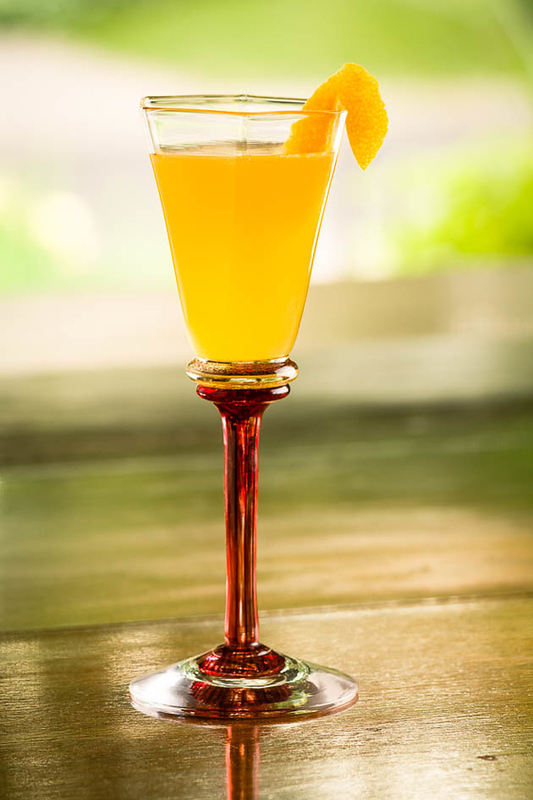 As mentioned above, I cut the proportion back just enough to cut the sweetness while retaining the liqueur’s orange peel flavor, but if you like your drinks sweet, stick to the equal parts. In a truly “equal parts” Olympic, the orange juice and Grand Marnier give the drink a lightly orange nose. The sip is sweet and rich, with a lush mouth feel from the liqueur. The long taste remains sweet and orange, with the brandy finally, barely, coming through. The adjusted version listed above is a bit less sweet, still characterized by orange, but lets the brandy come through a little more in the aftertaste. The bitters are not part of the original Olympic recipe, and are unconventional in a sour—especially one so clearly modeled on the Sidecar. They do provide another way to offset part of the drink’s inherent sweetness, though. You should definitely try the original formula, but the addition of bitters is something to experiment with. The ocean liner competition didn’t end in 1915, of course. The Olympic was superseded by the Queen Mary, and finally drydocked and sold for scrap just a couple years after Craddock published this recipe in the Savoy. The mid-1930s saw the spectacular but brief rise—and fall—of the zeppelin, but the great liners remained the keystone of trans-Atlantic travel. The premise for the whole production is a race between two new luxury liners, to see which can cross from New York to France in the shortest time. Art imitates life: the ships are called the Colossal and… the Gigantic. “The Olympic Cocktail” at cold-glass.com : All text and photos © 2016 Douglas M. Ford. All rights reserved.